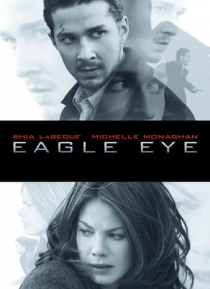 Eagle Eye is a race-against-time thriller starring Shia LaBeouf, Michelle Monaghan, Rosario Dawson, Anthony Mackie, Michael Chiklis and Billy Bob Thornton. Two unsuspecting Americans are separately drawn into a conspiracy by a mysterious woman they have never met, but who seems to know their every move. By the time they discover her frightening identity, they have become her unwitting accomplices … in a diabolical assassination plot.